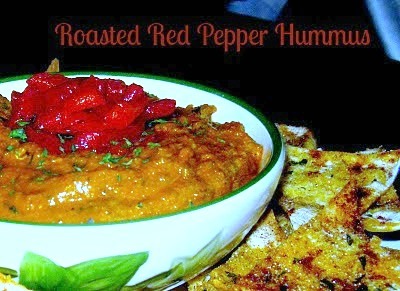 Roasted Red Pepper Hummus, a delightful dip made with chickpeas, roasted red bell peppers, jalapeños, and olive oil. Ideal for entertaining or just a quick and healthy snack. I had eaten store bought Roasted Red Bell Pepper Hummus before that was pretty good, but I decided that I could make some homemade. I am a huge fan of roasted red bell peppers. So much so, that for this recipe, I decided to dice up additional roasted red bell peppers and served them on the top of the hummus to be stirred in just before serving. A great way to serve this hummus is with my Out Of The Oven Pita Chips. In a food processor using the blade attachment, put all ingredients in the bowl except the olive oil. Put the lid on the processor and drizzle olive slowly until mixture is pureed and smooth in texture. Let set up in refrigerator 1 hour before serving. Top with 2 ounces roasted red bell pepper and stir in just before serving. It looks great! I love to whip up my own hummus- so simple & healthy.